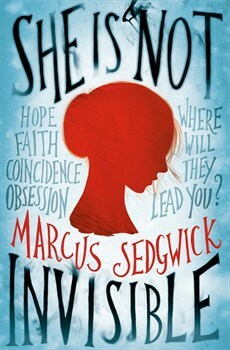 This is the Marcus Sedgwick we like. Strange, mystical, pacy, with vivid characters who leap off the page. Reminiscent of the wonderful ‘Revolver’ that was also short but perfectly formed, Sedgwick creates a world and people who emerge complete and totally real from the very first page. Laureth is a blind sixteen-year-old girl who is despite her lack of sight administers her famous writer’s father emails and fan queries. When she is alerted to the fact that his precious notebook has been found by a strange Mr Walker in New York she is immediately concerned. One - her father is supposed to be in Switzerland and two - her mother doesn’t seem to care two hoots as to where or what her father is doing. Her father doesn’t answer his phone or emails and he never goes anywhere without his notebook. Is he missing? Is there a divorce impending? What is going on? Benjamin her seven-year-old brother is her most treasured item. One he is gifted, two he can read extremely well, thanks to all the comic books he reads, and he acts as her ‘Seeing Eye’ brother, whether on the Internet or walking around. She normally only gets to be with him on weekends as she boards during the week but this is the holidays so she gets him pretty much to herself all the time. Her mother is going up north to a weekend party. Refuses to answer any sensible questions about her father and Laureth suspects impending doom all round. She asks for proof that it really is the notebook, knows as The Black Book, and Benjamin dutifully reads out the images Mr Walker sends from New York. Rashly Laureth concludes her father has been abducted and decides the she and Benjamin need to go to New York immediately and retrieve the notebook and find her missing father. To that end she ‘borrows’ her mothers credit card, books one-way tickets and early the next morning she and Benjamin (and Stan, his cuddly stuffed Raven) are on their way. They argue as to whether Stand needs a passport but Laureth thinks not. OK I am not going to quibble here, but if I go to New York I have to fill out the ESTA form detailing exactly where I am going to stay and for how long and there is no way they’d let me in with a one-way ticket but Mr Sedgwick deftly deals with the issue at JFK with a little trick that Benjamin has up his sleeve. I did mention he was gifted right? The Benjamin Effect is quite a useful trick. Laureth is resourceful, totally impractical, a romantic, if you will, who should be severely chastised for buying a ticket and flying off to find her father, dragging her little brother along because she needs his eyes. However there is a wonderful quixotic element to this story and Laureth and Benjamin live charmed lives. Mr Walker turns out to be younger than expected – and somewhat eccentric. Her father’s notebook details all his research on ‘coincidence’ or co-inki-dinks as Benjamin calls them. They read it avidly looking for clues as to where her father might be. She also find the hotel he was staying at and worm their way inside to his room, but of course he is missing and not there. This is much like a detective story reminiscent of Emile and the Detectives. Laureth needs to understand the research notes to trace her father, but has to rely on Benjamin to read them to her. Meanwhile – she is avoiding letting her mother know where she is and the money she ‘borrowed’ is disappearing rapidly. There is a nice touch on the plane when the boy next to her wants to give her his phone number until the moment he discovers she is blind and then suddenly goes all cool on her. She understands this, being invisible to people is something that happens all the time. But Laurent is emerging from her cocoon on this adventure, stretching the limits of what she can do and achieve and Benjamin is a rock, a fragile rock, beside her, not quite comprehending the enormous risks that have been undertaken. As we grow deeper into the mystery, following her father’s notes we discover the world of Jung and Synchronicity and Coincidences. Impossible or random? But do not be afraid, you will be ensnared and justly proud of what a sightless girl can achieve when she puts her mind to it. Sensitive, gripping, and nerve-wracking – this is an exciting rollercoaster of a story.